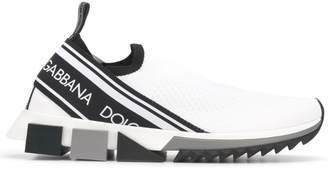 Dolce & Gabbana present these sporty black and white Sorrento sneakers for SS19. Cut from a stretch jersey upper with sublimation printing to allow the pores of the fabric to breath, these technical sneakers boast the Italian design duoâ€™s striking logo tape detail to the rear. Featuring a pull tab at the rear, these sneakers easily slip-on and are finished with a lycra footbed and a two-tone extra light rubber micro sole for optimum comfort.